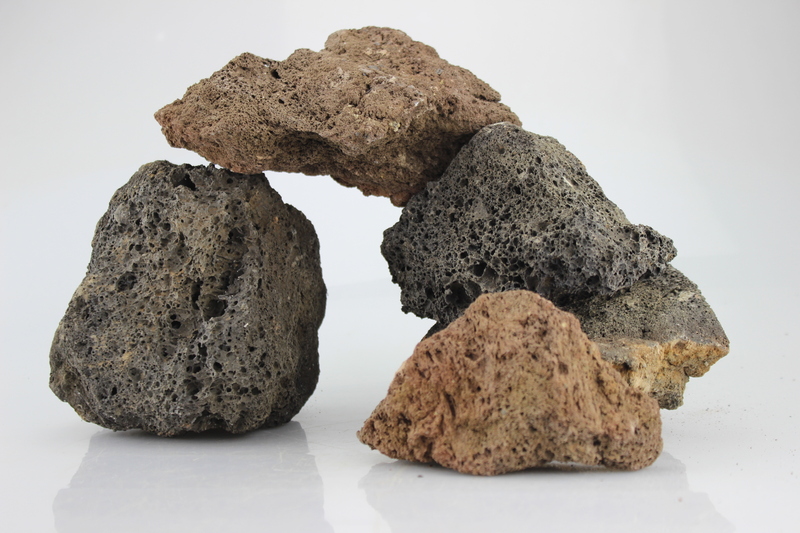 Lava Rock which is formed from the intense heat of volcanos has many hidden benefits for the aquarium that many hobbyist are not even aware of. This blog post on The Hidden Benefits of Lava Rock will give an insight into how this rock really does help. Lava Rock is perfect for providing the ideal living environment for your aquarium because it has beneficial denitrifying bacteria. This bacteria will improve your water quality by reproducing and then removing nitrates. You only have to inspect the rock and you can see it is covered in tiny holes making it extremely porous allowing water to pass through and diffuse into the rock. So what does The Hidden Benefits of Lava Rock really mean? An anearobic environment is created inside the rock as beneficial nitrifying bacteria consume all the oxygen in the water. Within this anerobic environment inside the rock, denitrifying bacteria consume the nitrate and produce oxygen and nitrogen. We all know how nitrate in the aquarium is bad news for fish and shrimp so Lava Rock really is the most natural and best way of removing nitrate. Lava is an attractive rock in its own right so not only is it beneficial, it is also ornamental too. They look very natural and stack very well indeed. Some people comment that it is like as if the rock has glue on it as it stacks together so well. It is so versatile and you can really have some fun playing around with different pieces and creating various shapes and constructions. It is popular for creating a cave effect (see picture below) making it a perfect refuge for certain fish and shrimp. Shrimp love to forage on Lava Rock in search of bits of food that may have fallen into the holes. Shrimp also like to have a safe place to hide when they moult so creating them a cave with small pieces would be ideal for them. It really is true The Hidden Benefits of Lava Rock! To grab yourself some Lava Rock please click here. There are a wide range of water conditioners available today which look after your water quality. In the past the sole water conditioner was a dechlorinator which removed chlorine from tap water. Tap water is perfectly safe for use in a planted aquariums if a dechlorinator has been added. Other water conditioners enable us to predetermine the water chemistry we so desire. Today there are liquid conditioners, filter media resins and some substrates which alter pH, absorb and bind specific chemicals. You can view our range here. In recent years major developments have been made to speed up the cycling process of an aquarium which has always been a big frustration for hobbyists. Some of you may already have working knowledge of what ‘cycling’ means – it takes about 6 weeks for ammonia (fish excrement) to be converted to nitrite and then the safer nitrate (cycling process). Can this cycle be sped up? It can to a certain degree using commercial products such as Nutrafin Cycle which reduces cycling down to 3-4 weeks. This type of water conditioner is always useful to have anyway, particularly after carrying out large water changes or adding new fish to your tank. Your filter can experience nitrite spikes and filter boosters can quickly get it back in shape. In addition to liquid filter conditioners, there are various filter media that allow for safe removal of toxins such as nitrite. These tend to be more economical and quite convenient as once the media is in the filter you don’t need to worry about adding more. It’s worth noting though that some medias can release what they have stored which can become problematic so the key is regular maintenance. Some medias are also renewable where others need replacing once they ‘become full’ – check the packet before use. If you want total control of your water (as some do) the answer is to purchase an RO Unit. RO is an abbreviation of reverse osmosis where tap water is passed through a membrane/s in order to purify and strip all minerals and impurities. The end product is pure water. However RO water is very unstable on its own and it’s the ‘impurities’ that ironically provide stability. By adding a product such as Seachem Replenish, specific minerals are added back to the water to make it more stable. RO kits can be purchased from £90 and up. In planted aquariums, it’s very important to try and work with the water which you have, i.e. that which comes out of the tap otherwise it can be an uphill battle to control your water variables. For example in hard water areas (high KH and GH), use a substrate which will set and stabilise your water parameters to the correct level. The best example of this is Naturesoil which we briefly mentioned in the Gravels/Substrates section. In some parts of the UK, tap water has high levels of nitrate and phosphate and that is one exception where an RO Unit will be highly beneficial. Chemicals. If you decide to use chemicals to alter your water parameters such as Kent pH minus, whilst this is effective, there are many factors that can change water in a planted aquarium. I have personal experience of battling with tap water from all parts of the UK, and I never totally achieved what I wanted. Did this matter? No, but at the time I was very determined!